Residential Home Air Conditioning Sales in Brevard County, Florida - Serving Melbourne, Titusville, Palm Bay and surrounding areas. We service, sell and maintain all types of heat pumps here in Florida, a brief description of a heat pump is: an air handler inside and a heat pump condensing unit outside. The refrigerant lines connect the two together and through these refrigerant lines heat is transferred either from in the house to the outside in the summer, or from the outside into the house in the winter. In the outside condensing unit there is a device called a reversing valve that is activated through the thermostat. When you go from AC mode to HEAT mode at the thermostat it tells the reversing valve to reverse the heat transfer process. So now the heat from the outside air will be transferred to the inside of the house. When the air coming out of the registers is compared to that of a gas system it is not nearly as hot. The heat coming from the heat pump is not as hot as our body temperature so it feels cool when blowing directly on you. When it gets below 40 degrees outside there is not much heat left in the air so there is an a Auxiliary heater that will kick in to assist the heat pump, this is known on most thermostats as Emergency Heat. When they are both on at the same time the system is not nearly as efficient. We service, sell and maintain all types of gas furnaces here in Florida, a brief description of a gas furnace system is: you have a straight cool condensing unit outside connected to an evaporator coil on the inside through the refrigerant lines. The evaporator coil sits on top of the gas furnace. 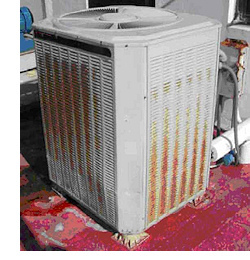 In the summer, inside heat is transferred from the evaporator coil to the condensing unit through the refrigerant lines. Gas is not used at all in cooling mode this is an electric cooling system. The electric fan in the furnace blows across the ice cold evaporator coil this is where you get the cool air from. In the heating mode the evaporator coil and condensing unit are not used at all, gas is burned at the heat exchangers and the electric furnace fan blows across these exchangers and you have a very warm, consistent heating system. Gas heat is much hotter and more efficient in heating mode and more practical in conditions that call for long periods of heat in the winter. We service, sell and maintain all types of air conditioners with electric heat strips here in Florida, a brief description of an air conditioner is: You have an air handler inside and a straight cool condensing unit outside. The refrigerant lines connect the two together and through these refrigerant lines heat is transferred outside in the summer. When you go into heating mode at the thermostat the outside condensing unit shuts off completely, it is only used for cooling the house that is why it is called straight cool. Inside the air handler you have heating strips that heat up like a toaster and the fan blows across the heat strips giving you electric heat. The heat strips draw a lot of energy so if used in cooler climates could cost you a fortune in power usage. The above heat pump is triple the efficiency of this system in heating mode. We service, sell and maintain all types of Geothermal heat pumps here in Florida, a brief description of a Geothermal heat pump is: A heat pump also called Geo-Exchange, earth-coupled, ground source or water-source heat pump and is a heating/cooling system that uses the earth´s ability to store heat in the shallow ground or water. Thermal heat pumps are known also as "Geo-Exchange" systems, or "ground source heat pumps" and they are different from air source heat pumps because they use the earth to heat or cool. Ground source heat pumps draw energy from shallow ground. The energy originates from the sun: none of the energy originates from the centre of the Earth, in spite of the name "geothermal heat pump". Classic genuine geothermal energy from the centre of Earth is available only in places where volcanic activity comes close to the surface. 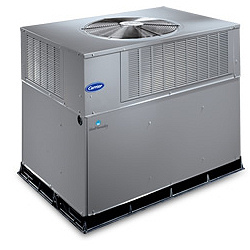 FHP or Florida Heat Pump and Cold Flow are the most common brands and they are the only manufacturer’s that are completely dedicated to these types of systems. Water source or geothermal systems operate based on the consistent underground temperatures: such as the shallow ground, this is the upper ten feet of Earth’s surface. It has a very stable temperature throughout the year - between 50 and 61 °F, depending upon location's annual climate. Like a cave, the shallow ground temperature is warmer than the air above during the winter and cooler than the air in the summer. A geothermal heat pump uses that available heat in the winter (heating) and puts heat back into the ground in the summer (cooling). Here in Central Florida the FHP geothermal is usually used in a water-source open loop system pulling water from a well, pass through the FHP’s heat exchanger where heat is exchanged with the refrigerant inside and returned to a well or simply disposed of in yard or sprinkler system. The most common problem in Brevard county is most cities require a reclaim well and won’t allow the water to be disposed any longer and the cost of a reclaim well discourages customers from going back to this type of system. System life is estimated at 25 years but for this open loop type of system it depends on the quality of the water in the ground. There are approximately 50,000 geothermal heat pumps installed in the United States each year. A geothermal system differs from a conventional furnace by its ability to transfer heat versus the method of producing heat through combustion. As energy costs continue to rise and pollution concerns continue to be a hot topic, geothermal systems may hold a solution to both of these concerns. These units also have the new r410 refrigerant, scroll compressor, powder coat cabinet finish and stainless steel drain pan. I would only recommend this type of system if you live in a coastal area, near the ocean, already have Geothermal (water to air) system and want to replace it. Geothermal ground water systems are nice because you don’t have an outside unit exposed to the environment. Check local codes to see if they allow it to be replaced without a reclaim well. 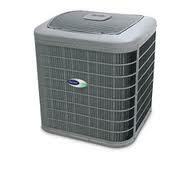 If you choose to convert to (Air to Air) central system we are your experts. We have installed many FHP over the years and when codes require a conversion we have converted hundreds. Also if your sprinkler is tied to your water to air system we can loop the water lines and add a switch to allow you to still use your sprinkler system after the water to air system has been removed. No matter what your needs call today for a free estimate. 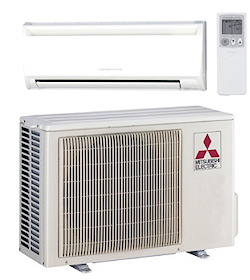 We service, sell and maintain all types of ductless mini split systems here in Florida. If you have a Florida room you want to air condition but there is no way of running ductwork then you should consider a ductless mini split system. There are three parts: the head that is mounted preferably on an exterior wall, the refrigerant/drain lines that go out the wall and connects to the outside condensing unit. We install the outside condenser on a prefabricated concrete pad. The refrigerant and drain lines are covered by an attractive line cover that can be painted. The head is where you filter and where the cool air blows out. The TEMP is controlled by a remote control. They can both heat and cool. This is a very affordable option when installing ducts isn’t possible. The indoor head is clean looking and the breeze is silent while blowing out ice cold air. They come in different sizes and very cool designs. They allow you the freedom to zone one room to ideal temperature no matter the weather. They get up to 24 Seer and have the new PURON (R410) refrigerant. They are virtually silent when running unlike classic window style ac units. This is a great unit for a Florida room that has never had air or a room that was added on and because of the roof pitch not able to run ductwork. We service, sell and maintain all types of packaged units here in Florida. A packaged unit is where everything is located outside. Most manufactured homes have a packaged unit. The packaged unit only has one piece outside: it heats, cools, blows, everything happens outside, everything is packaged together. It sits on a pad outside the home. There are two outlets on the packaged unit usually covered by a shroud (piece of aluminum that protects the two trunk lines from the packaged unit from damage and prevents animals from getting under the house). One of the trunk lines is attached to a collar under the house that pulls air from the return air grill inside the house. The other line attaches to the supply collar under the house and blows the conditioned air into the registers. If you are concerned about your outside condenser holding up against Florida’s harsh environment then you should consider a coil and cabinet treatment. For people who live near the beach this is a must have protection with the ocean salt in the air. Between the sun and salt in our air your outside condenser takes a beating all year long. There is a product that can greatly slow the deterioration process down and it is called THERMOGUARD. This is a unique metallic impregnated polyurethane base coating that when applied properly extends the life of your whole condensing unit. This product is used in both residential and commercial applications. It not only extends the life of the condensing coil but also products the paint on the cabinet. The product should be applied at the warehouse before the condenser is exposed to the environment.